Home Afro History	Today in Afro History ! 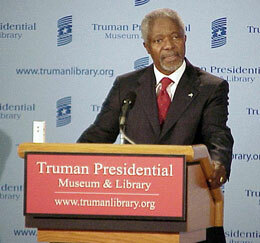 Kofi Annan is elected as the Secretary General of the United Nations in 1996 ! Today in Afro History ! Kofi Annan is elected as the Secretary General of the United Nations in 1996 ! Today in Afro History ! Saint Kitts and Nevis joins the United Nations in 1983 ! Today in Afro History ! Bernard A. Harris Jr. becomes the first Afro American to walk in space in 1995 ! Today’s Afro Birthdays ! Football Heisman Winner, Ernie Davis ! NBA player, Anthony Mason ! Jazz Musician, Clark Terry ! Actor, Hal Williams ! Journalist, Stanley Crouch !